Despite his 13-second loss to Conor McGregor back in 2015, UFC featherweight champion Jose Aldo remains the best 145-pound fighter to ever do it. Aldo will get another opportunity to prove just that when he tries to end interim champion Max Holloway’s 10-fight win streak later tonight (Sat., June 3, 2017) at UFC 212 live on pay-per-view (PPV) from inside the Jeunesse Arena in Rio de Janeiro, Brazil. The featherweight title unification bout will deservedly serve as the main event of the evening and mark the first time Aldo is fighting on South American soil since defeating Chad Mendes at UFC 179 back in 2014. In order to prepare ourselves for UFC 212’s impending headliner, let’s take a look at what both Aldo and Holloway need to do in order to leave Rio de Janeiro with the UFC featherweight title wrapped around their waist. While Aldo will enjoy a one-inch reach advantage come fight time, Holloway is one of the rangier featherweights on the roster. In order to limit the challenger’s ability to attack from distance, Aldo must work inside in the early going to keep Holloway guessing. That doesn’t mean that Aldo will have to stay chest-to-chest to Holloway, he just has to make his presence felt. 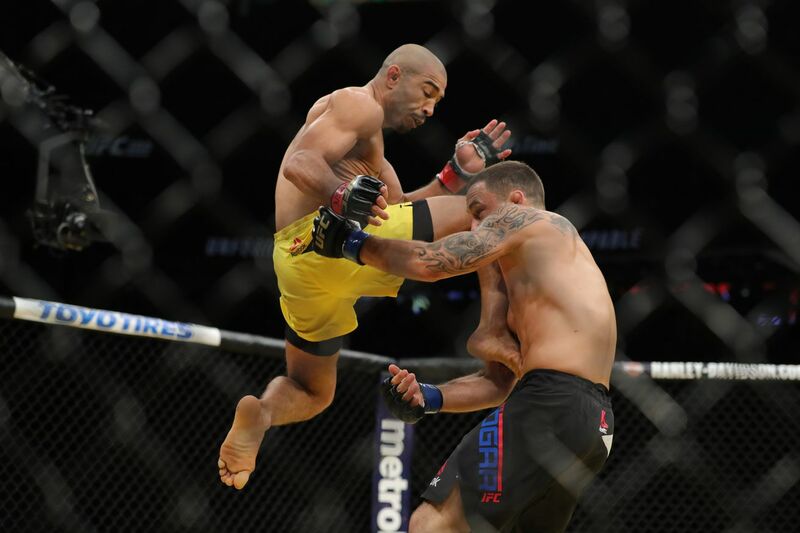 Aldo’s leg kicks should play an intricate part in feeling out distance on the feet, softening Holloway up, and making it difficult for the challenger to explode from the outer edges. Aldo and Holloway are two featherweights capable of finishing fights, but more than likely they’re going to cancel each other out in that regard at UFC 212. If that is the case, Aldo must do everything in his power to gain control early, force Holloway to fight defensively, get the crowd behind him, and inflict as much damage as possible to slow down the Hawaiian’s shifty striking. But to remain effective throughout all five rounds while controlling the pace of the fight, Aldo needs to conserve power. The Brazilian has faded late into fights in the past, but showed a real evolution in his conditioning last time out opposite Edgar. If he can display the same level of production and energy retention, it’s going to be hard for Holloway to score more points and land heavier shots in the later rounds. Luckily for Holloway, he’s going to be the longer fighter at UFC 212. Aldo will have the reach, but the Hawaiian will have a four-inch height advantage and be able to gauge his distance much better against a smaller opponent. This bodes well for Holloway considering he’s a rangy striker at heart who enjoys landing combinations from all sorts of angles and positions. Aldo is going to be the second smartest striker that Holloway has ever faced, but if the challenger can remain long, attack from the outer edges, land crisp boxing, jump in and out of exchanges, and circle when it’s needed, he should find immediate success against the champ. While Aldo is the one known for crushing leg kicks and knees, it is Holloway who will benefit the most from landing below the neck at UFC 212. It’s not going to be easy to get inside and hurt Aldo to the body, but Holloway’s range and unpredictable footwork could allow him to find a home early. If the challenger can do meaningful damage in the first 10 minutes he’ll essentially limit Aldo’s movement and explosiveness in the later rounds. That would create more windows of opportunity for Holloway to attack Aldo and a diminished chance of Aldo overloading Holloway with power on the feet. MMAmania.com will deliver LIVE round-by-round, blow-by-blow coverage of the entire UFC 212 fight card, starting with the Fight Pass “Prelims” matches online, which are scheduled to begin at 6:30 p.m. ET, then the remaining undercard balance on FOX Sports 1 at 8 p.m. ET, before the PPV main card start time at 10 p.m. ET.